Six Star Elite Series Whey Protein Powder with 32 grams of Protein in Triple Chocolate takes your workouts and body to the next level. Our formula differs from a regular whey protein by focusing more on your lean muscle. Our protein powder mixes instantly in your drink, smoothie or shake to make your prep easier than ever. The delicious triple chocolate flavor will make you look forward to mixing your daily supplement for your workouts. Our formula uses special ingredients and has a unique micro filtering process to speed up your muscle recovery so you can be ready to hit the gym harder than ever. Six Star Elite Series Whey Protein Powder has been tested, and our results found that subjects using our protein powder built 70% more lean muscle than subjects who did not use our whey protein powder. Our proteins help a variety of fitness levels and supports muscle gains on all different types of athletes. Ingredients: BCAA+ Blend: L-Glutamine and Precursor (As Whey Protein, L-Glutamine) (5.2 g), L-Leucine (As Whey Protein, L-Leucine) (3.6 g), L-Isoleucine (As Whey Protein, L-Isoleucine) (1.9 g), L-Valine (As Whey Protein, L-Valine) (1.9 g). Scientifically Studied Muscle Builder: Creatine Monohydrate (2.5 g). Other Ingredients: Whey Protein Plus Blend (Whey Protein Concentrate, Whey Protein Isolate, 97% Whey Protein Isolate, Hydrolyzed Whey Protein), Maltodextrin, Cocoa (Processed with Alkali), Natural and Artificial Flavors, Gum Blend (Cellulose Gum, Xanthan Gum, Carrageenan), Calcium Carbonate, Soy or Sunflower Lecithin, Salt, Sucralose, Acesulfame-Potassium. Dosage: How to Make the Perfect Whey Protein Shake: Stir or Shake or BlendTip: Try blending with ice, your favorite fruit, juice, peanut butter or anything else you enjoy for a delicious smoothie.Mix 1 to 2 servings (1 to 2 scoops) in 5 to 10 oz. of cold water or skim milk, according to taste, in glass or shaker cup. Use between major meals and before and after exercise. Maintain an adequate state of hydration during use. Read the entire label before use and follow directions provided. Instructions: How to Make the Perfect Whey Protein Shake:. Stir, Shake, Blend. Tip: Try blending with ice, your favorite fruit, juice, peanut butter or anything else you enjoy for a delicious smoothie. Directions: Mix 1 to 2 servings (1 to 2 scoops) in 5 to 10 oz. of cold water or skim milk, according to taste, in a glass or shaker cup. Use between major meals and before and after exercise. Drink 8 glasses of water daily for general good health. Read the entire label before use and follow directions provided. Shake container before use. NOTICE: USE THIS PRODUCT AS A FOOD SUPPLEMENT ONLY. DO NOT USE FOR WEIGHT REDUCTION. WARNING: NOT INTENDED FOR USE BY PERSONS UNDER 18. Do not use if pregnant or nursing. Consult a medical doctor if you have a medical condition or before starting any diet or exercise program. KEEP OUT OF REACH OF CHILDREN. DO NOT USE IF PACKAGING HAS BEEN TAMPERED WITH. I have been using other brands of Whey Protein for awhile now and the Six Star Whey Protein Plus is by far the Best. 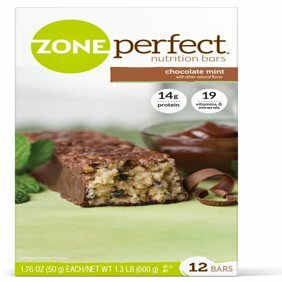 The triple chocolate flavor is fantastic and easy to mix too. Only one scoop is needed. Weight of product is 2.00 lbs (907 g). Enhanced with 2.5 grams of Creatine per serving . It has 0 Aspertame, 170 Calories, 2 grams of Sugar, 0 grams Trans Fat, 100 mg Sodium, and 30 grams of Protein in a serving. If you are looking for a protein drink this one is excellent because of the low sugar and sodium content. I suggest using water to mix it with because you get less calories plus it mixes well in water. I also like to use my blender and add ice to mix. I use it for breakfast and sometimes for a lunch or dinner meal - great to drink when you don't have time for meal. Protein in your diet can help you to eat less because you tend to be fuller (not a weight loss Supplement). Whey Protein is used in helping you build muscle and strength. I would recommend this product. It is a great value for the price. I love it and would buy the product. What a yummy way to get a great amount of protein. My internist recommended that I add whey protein to my diet for muscle and strength. She said it is very important for seniors also to receive the benefits of a whey supplement. I never would have thought of the idea myself. This the third brand of whey protein I have consumed, and without any debate, Six Star Whey Protein Plus Triple Chocolate is the superior supplement in taste and ingredients. Important to me -- it's not too sweet! I first mixed it plainly with milk. Delicious, but why stop there? Now, for a really healthful smoothie, I use my blender with three scoops of the triple chocolate, frozen mixed berries, plenty of kale, spinach and about a cup of milk. This recipe makes six thick 8-ounce cups. I drink a large glass when made, and freeze the rest in 4 cups. Sometimes, I scoop a frozen cup with a spoon and eat like it ice cream. Other times, I microwave to a soft sorbet, and with a meal -- defrost it as a shake. Learning about this MuscleTech product has informed me that it contains BCAAs, glutamine and digestive enzymes as well as creatine. As a senior I am excited to learn more, and combine my blender creations with an exercise program to gain strength and muscle. Using Six Star Whey Protein is a no brainer. EXCELLENT PRODUCT AT VERY REASONABLE PRICE! This review is not your normal one for whey protein as we don't use it for the "workout" rebuilding muscle, etc. reasons. We are elderly buyers who occasionally use a whey protein drink as a meal replacement. Sometimes we just don't feel like a big meal, but know we need to eat (or drink) healthy instead of just snacking. It's amazing as you get older how just a drink like this can fill you up, make you feel satisfied and also be very healthy for you! I usually go for the vanilla flavor, but my husband loves this triple chocolate and sometimes, now that the weather has turned cold, heats it up, tops it with just a few mini-marshmallows and enjoys a nice, hot HEALTHY beverage. I always mix it with skim milk and do the mixing in our blender to achieve a really smooth consistency. We tried several different brands (some of them much more expensive) and really feel like this product is our favorite. We're not into all of the body building facts that others are, but this is good-tasting, easy to prepare and give us a feeling we're doing something good for our bodies while keeping calories in check. Highly recommend Six Star Pro Nutrition Whey Protein for the regular user goals and also for us seniors!! i wanted to give my opinion on they Whey Protein products. I have a son that has been wanted to beef up his body a little, he is about six foot tall but has always had a slender body. 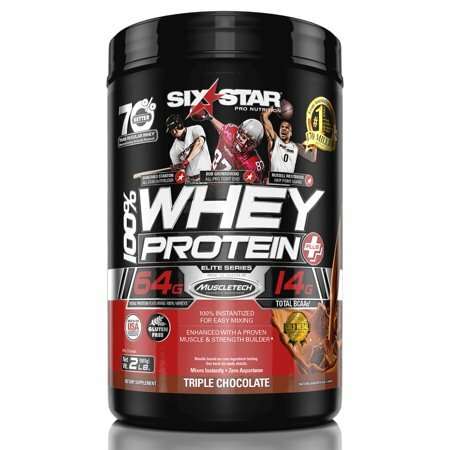 The product tested was Six Star Whey Protein Elite Series in the Triple Chocolate flavor. He uses this product twice per day before he goes out to do a little weightlifting. He mixes it up in a shaker cup with the little ball insert to mix the powder and milk, he claims this is the best way to mix it up. He loves the taste something like a chocolate shake. He has been using the product for over a year now and i was surprised of the definition that can be seen in his muscles. His arms and legs have increased in size and he now has a six pack , so this product must be working because i happen to know that he does not eat right , too much pasta and fast food. So i gave this product a five star rating and it deserves it. I lost a lot of weight after prolonged back issue's and tried several products to help maintain and keep my weight on,which never seemed to work. I am a small framed women and slender built and have always had trouble gaining weight and keeping it on. I really like this Six Star Pro Whey Protein. I make a protein shake after my morning walk and exercise routine using this added to soy milk, banana, pineapple and ice cream. It is absolutely delicious and helps to stabilize my weight and maintain it. I also love the chocolate flavor and recommend this Whey Protein mix highly. Great service from Walmart.com as usual. Thank You!